So this is my first formal address to you all since taking on the mantle of Alpha. It’s been oddly smooth, due to the support of all you fine Worgen, and also due to the Christmas break. I’d like to take this time to re-assure you all that events will be back in full swing come the New Year. I feel it’s important to take time between Christmas and New Years to spend quality time with family. Now on to business. I am now actively looking for more people to join the ranks of Sentinel and Beta. Our Sentinel rank as you should know is considered our Recruitment rank. People in this rank should be actively promoting our Guild and trying to bring as many new members in as possible. Further this rank should also be seen as the people who help new members. 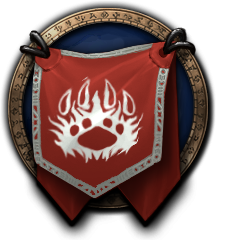 If you feel you could actively engage with new Worgen to try and bring them into the guild, you should look at making your intentions known to me or any of the officer team. Our Beta’s are in charge of formal events for our members as well as encouraging non-formal events (such as random bg’s or casual RP). In previous years this rank has had restrictions on how many could achieve this rank. However I feel with how we work the guild now, this could lead to our officer team burning out. What I’m looking for in a Beta is someone who can dedicate time to making at least one event a week, either solo or in conjunction with other members or even other guilds. This is not an easy rank to achieve. To show you are ready for it you must first make your intentions clear to me, and then actively show (within the type of content you prefer i.e pve pvp or rp) that you are able to create quality events. Finally, in my next address to the Pack, I will be outlining some new ways for our members to be earning some weekly gold. Before signing off, I’d also like it to be known I am happy to hear suggestions in regards to pretty much anything that you feel might make the guild an even better place to be. Will be wonderful to see the next generation of Betas help carry on the traditions of the guild!